Although 2018–full of steep price drops and unfulfilled crypto promises–has been a difficult year for the cryptocurrency market, innovators, investors and legislators continue to build and plan for a blockchain-based future. Jonathan Gagliardoni is the CEO and founder of Token Forum. 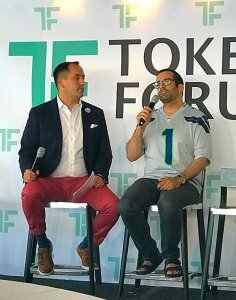 Jonathan Gagliardoni hosted the first Token Forum Seattle on Aug. 9 at the Columbia Tower Club, bringing together a group of crypto industry leaders, experts and advocates for a deeper look into blockchain’s most important topics. Featuring panoramic 76th-story views of Seattle and over 200 blockchain and crypto enthusiasts, an event of this caliber was long overdue for the city and promises to be the first of many for the region. The inaugural event focused on advanced topics and was geared toward blockchain industry professionals. By targeting a savvier audience, there was a strong emphasis on creating networking opportunities. Peter Vessenes, CEO of New Alchemy and the first chairman of the Bitcoin Foundation, gave the opening keynote address and spoke about his history in blockchain and how the inception of the Bitcoin Foundation began in Seattle in 2012. Quite the mouthful, self-sovereign identity (SSI) breaks down into three related but separate categories: security, identity, and ownership. One problem with the current state of security is the tendency for companies to aggregate one’s data into a single place. This method of data storage not only makes one’s personal information vulnerable but also highly lucrative to potential hackers. The “Mobilizing Social Impact In Blockchain” panel included (left to right: Alex Ortiz, Mike Cartwright, Alexsandra Guerra, Raustin Memon and Dominick Garrett. For example, in the Equifax hack that affected over 140 million Americans, the perpetrators accessed sensitive data including names, date of birth, Social Security numbers, home addresses, tax IDs and driver’s license details from one successful breach. One contributing factor to hackers’ success is the rigidness of current identity systems. Instead of verifying identity while divulging the minimum amount of personal details, one has to fork over multiple, all-encompassing documents. However, if identities could be separated, companies would only have the necessary information to identify its customers, making individual hacks much less profitable and information more secure. Self-sovereign identity would return the ownership of personal data back to individuals, not companies. Companies such as Google and Facebook profit massively from user data while also controlling the data associated with each account. If someone wants to leave Facebook, he or she can’t take all their pictures, comments and related information with them. Token Forum enjoyed crispy, top-floor views from Seattle’s Columbia Tower. Companies such as LifeID, meanwhile, are working to build a decentralized identification system that could circumvent some of the problems discussed. The potential of blockchain to solve identity issues, as well as provide different avenues of value, has also captured the attention of U.S. Rep. Derek Kilmer and Dr. Joseph Williams, who were in attendance and spoke on panels. Given crypto’s wild volatility, the poor performance of most ICOs and its complex jargon, it is easy to understand why the average person may be turned off by cryptocurrencies. Despite all this, there is a lot of value that cryptocurrencies can deliver to everyday people and communities. The key to unlocking that value is clear communication, ease of use and policy development and regulation. Dr. Williams, Washington’s director of economic development for the information and communication technology sector, shared that sentiment. He asked, “what’s the problem you’re trying to solve?” Once the answer is clear, it doesn’t matter if people understand how it works under the hood, as long as the solution is functional and it solves that problem. 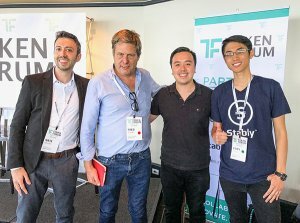 On the “When to use a Token to Power a dApp” was (left to right): Kory Hoang, Jason White, Robert Mao, Adam Gerring, and Simon Yu. Functionality and ease of use will also be a major factor in mainstream adoption. Despite using gamified micro-tasks to reward more than $2.6 million to over 100 countries worldwide, Simon Yu, CEO of Storm, briefly spoke about some of the hurdles users currently face to cash out rewards. According to Yu, after being rewarded Storm for completing a micro-task, users must transfer the tokens to an exchange like Binance or Bittrex, exchange Storm for BTC, then send that BTC to an exchange like Gemini or Coinbase to sell for their native currency. In an ideal scenario, users would be able to turn Storm into money in one step, and they may be able to do so soon with new Bittrex altcoin/USD ramps. As functionality improves, it’s reasonable to expect more adoption will follow. Blockchain has already shown its real-world efficacy. Lawrence Lerner, CEO of Pithia, a blockchain-focused venture capital group, pointed out that Shenzhen, China, is using blockchain as a legal tool to record evidence in trials; meanwhile, Dr. Williams provided the example of Estonia storing sensitive information on a blockchain to protect itself from potential Russian attacks. They proposed that one day, blockchain technology could also provide ways to improve voting. The “Open Discussion with Government and Blockchain” panel included (left to right): Lawrence Lerner, Joseph Williams, and U.S. Rep Derek Kilmer. Rep. Kilmer, who serves on the Washington State Congressional Blockchain Caucus, said the next step for blockchain is proper policy development and regulation. Ultimately, policy and development should happen with the developing space, not to it. In turn, this will ensure that the U.S. remains a leader in cutting-edge technology and keep its citizens competitive in a rapidly changing environment, a sentiment shared in the comments on the Cboe Bitcoin ETF proposal the SEC shared. Overall, if companies working in the space can continue to improve their products and clearly communicating use cases to the public and government representatives, blockchain technologies can make a tangible impact in the near future. A fireside chat with Jonathan Gagliardoni and Unikrn founder Rahul Sood. With the rise of security tokens, Marble predicted a transition from unregulated ICOs to full-regulated STOs. In his view, ICOs have become negatively associated with scams. Although STOs will take longer to raise capital, they will better protect investors and ensure real products are created. Promising ICOs like EVERY* still exist; but Marble’s beliefs warrant strong consideration given the track records of many failing ICOs. Marble ended his presentation with the conclusion that, instead of setting up crypto companies in jurisdictions like Gibraltar and Malta, as suggested by Rahul Sood, CEO of eSports company Unikrn, STOs are the American way to create real and impactful blockchain-based companies. Stablecoins, otherwise known as cryptocurrencies issued 1-to-1 against traditional fiat money, have been a topic of controversy. While companies like Tether have been accused of manipulating the BTC market with excessive printing, stablecoins provide a quick and free way to transfer money. Providing a real-world example, Kory Hoang, CEO of Seattle-based Stably, shared a story of sending money to his cousin in Vietnam. While he originally would send $400-$500 through Western Union, losing $12 in transaction fees each time, he soon discovered Tether, which allowed him to send money to his cousin quickly and for free. Seeing the power of stablecoins, Hoang soon thereafter founded Stably. Hoang’s anecdote clearly demonstrates the power of stablecoins to quickly transfer money. However, serial entrepreneur and founder of WorkCoin Fred Kreuger, went one step further, boldly stating that stablecoins would make Bitcoin obsolete and that they were the future of cryptocurrency. While his statement would be considered heresy to many crypto enthusiasts, he argued that stablecoin’s stability and ability to scale were far superior to Bitcoin and Ethereum. Despite the negative sentiment generated in the crypto bear market, the Token Forum demonstrated that blockchain is here to stay and that innovators, educators and legislators must continue to work together to build the future. 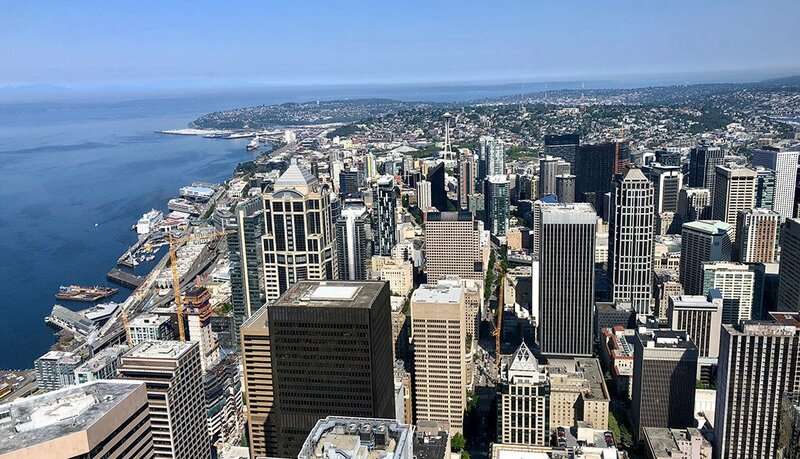 With its tradition of innovation, from Boeing to Microsoft to Amazon, Seattle is now solidifying itself as a worldwide blockchain hub. Home to a wide variety of crypto companies–including Bittrex, Storm and Dragonchain, as well as a host of many startups–Seattle will definitely be a city to watch in the global blockchain evolution.